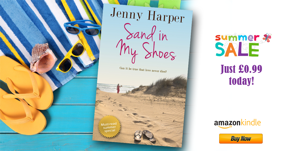 Today I’m delighted to be able to share with you a tasty snippet from the lovely Jenny Harper’s new summertime novella, Sand in my Shoes. 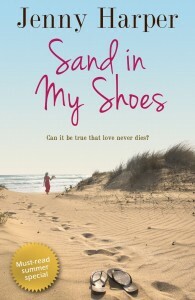 At only 99p or 99c, Sand in my Shoes is an absolute bargain!! A trip to France awakens the past in this heartwarming summer read from the author of People We Love. Head teacher Nicola Arnott prides herself on her independence. 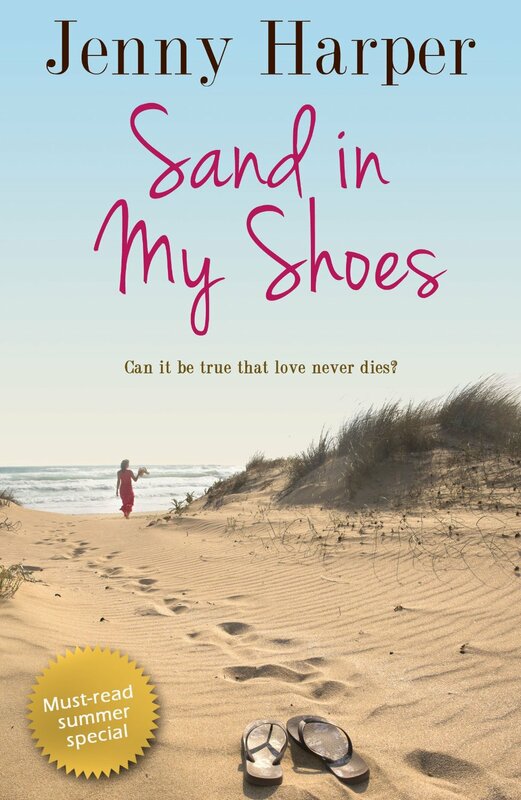 She has successfully juggled motherhood and career, coping with early widowhood by burying her emotions somewhere deep inside herself. When a cancer scare shakes her out of her careful approach to life, she finds herself thinking wistfully of her first love, a young French medical student. Nicola Arnott pushed open the French windows onto the balcony of the apartment she had just rented, and stepped out Above her, the blue and white striped canopy offered shade, but not coolness. She gasped – not at the heat, but at the view. She’d seen it, of course, on the letting agent’s particulars – after all, it was the view that dictated the price, not the apartment’s facilities, which were meagre – but no photograph could do justice to the panorama that greeted her. She’d enjoyed so many holidays in France with David – in the Loire valley and the Dordogne, on the Côte d’Azur and in some of the country’s great cities – before Eleanor had been born. After that, they’d had so little time together before he’d been snatched from her. Now she was back. She watched a dinghy tack and change direction, its sails startlingly white against the bright blue waters of the Bassin d’Arcachon. Picture postcard perfect. Unthinking, she grasped the balcony rail and yelped. It was burning hot. Nicola felt no pain when she thought of David, only love. But all memories were softened by time. If she were really honest, hadn’t they fought over everything? Whether to get up early to explore or laze in bed till midday. Whether to open the window at night or keep it closed. Whether to walk or take a taxi. Little things. Things that didn’t matter, but niggles that were easy to forget in the aftermath of loss. It hadn’t been real fighting, just bickering – the kind of bubbling undertow that characterises many relationships but doesn’t affect the core. She stood and stretched. Here she was, reminiscing already, and she hadn’t even unpacked. In any case, David had died twenty years ago and she had rebuilt her life since then. She had her work – at the primary school where she was headteacher – wonderful colleagues and friends, and several hundred children who filled her days with laughter and young life, and gave her all the challenges she could wish for. She had Eleanor, her daughter, and she had her beloved West Highland terrier, Darcy. So what if she hadn’t found love a second time? That had been partly circumstance, partly choice. The boat had tacked again. Now it was heading for the low islands off the Grande Dune du Pilat, the magnificent three-hundred-and-sixty-foot-high natural sand dune that was one of the main tourist attractions of the area. She knew the islands well. Hadn’t she sailed there with Luc that extraordinary summer? Sweet sixteen, and never been kissed? She’d celebrated her seventeenth birthday on the third day of her holiday in Arcachon with her parents. The night she’d met Luc. The memory of it made her smile, the sense of him stronger now that she was back here. She pulled a chair towards her. Its metal feet, grating on the tiled floor of the balcony, set her teeth on edge and she sank onto it with a grimace.